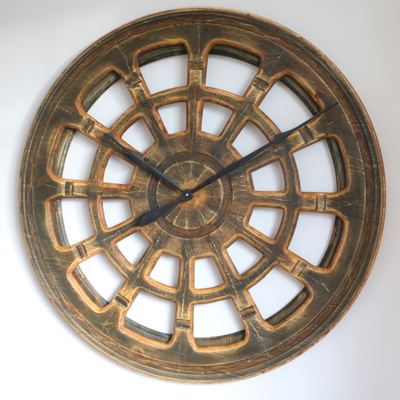 Extra Large Round Clock. Made of Wood and Hand Painted. 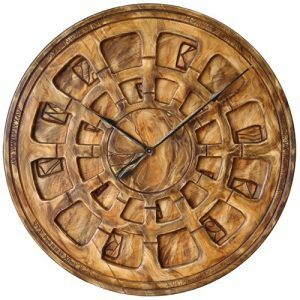 The “Ocean Shell” large round clock is handmade from two panels of sustainably sourced pine wood. 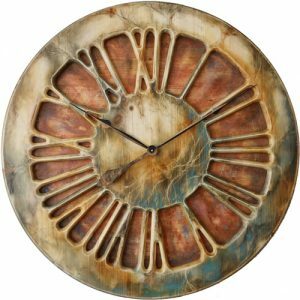 Unlike most our clocks the “Ocean Shell” doesn’t display traditional roman numerals. 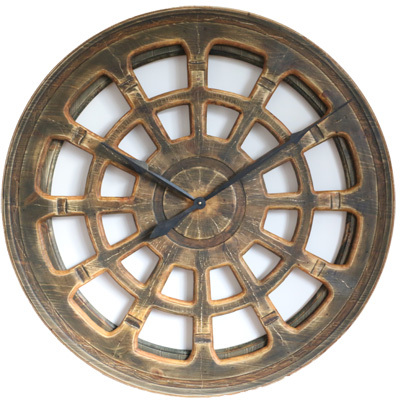 Instead it has very modern and unusual clock face design. 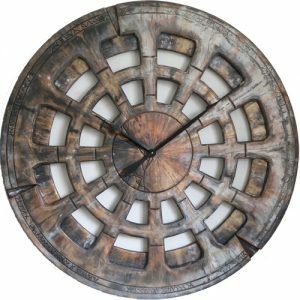 The narrow wooden rim attached at the back provides three dimensional look. We can make it in three different sizes to suit most requirements. 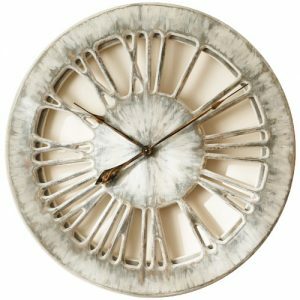 Unlike most our handmade timepieces, the “Ocean Shell” doesn’t display the traditional roman numerals. Instead it has the most exceptional contemporary face design with earthy colours and amber edges. We cut it out of single panel of pine wood and attached the narrow wooden rim at the back. This certainly provides more three dimensional look. 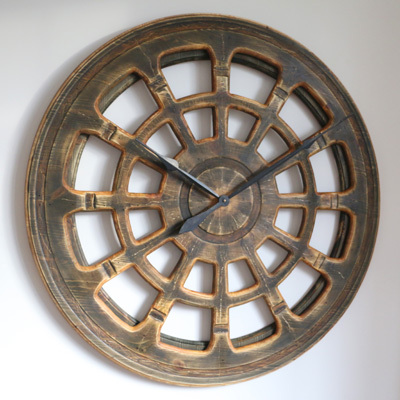 Have you ever considered displaying this kind of large round clock in your living room? Join our growing Facebook Community and see thousands of people already admiring our large artistic wall clocks. There are many reasons why you may want to purchase from us. 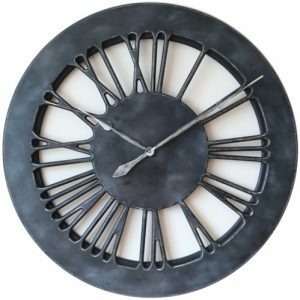 Perhaps you need to fill this large empty wall space in your lounge or hope to impress the customers coming to your office with remarkable statement clock? Maybe you are trying to find the most unique gift for someone you love or care about? Whatever your plan is just remember that those wonderful timepieces are designed to be mounted internally. Please keep the distance from any heat or moisture sources because it can reduce the lifetime of the mechanism and let the wood dry. The clock mechanism is the most powerful Quartz sweep movement that requires a single C Cell battery. We deliver it with hands detached to prevent any damage in transit. In this short video I am demonstrating how you can attach the clock hands and adjust the time. Don’t follow the old habits, challenge accepted thinking and make our beautiful timepieces the new fashion. 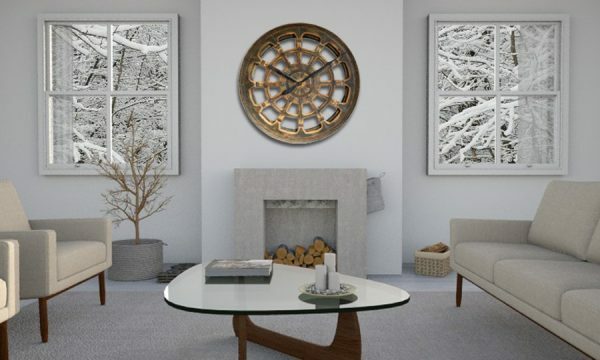 If you are looking for uniqueness and character Peak Art is leading this niche market with our flagship large round clock designs that aren’t available anywhere else.